“First Man” is a mesmerizing, exquisite production—the type of long, patient epic that Hollywood doesn’t seem to make anymore, perhaps because the powers-that-be feel its length, its quietude, and its slowness won’t engage modern audiences, who’ve grown too accustomed to zippy, fast-paced action. Of course, zippy and fast-paced have their place, too, but Oscar-winning director Damien Chazelle (“La La Land”), now at the ripe age of 33, knows slow and steady were right for “First Man.” This should come as no surprise, since Chazelle proved early in his career with the powerful “Whiplash” (2014) that he has a natural instinct for knowing the best approach to tell a story. And now, with his third major entry into mainstream Hollywood moviemaking scene, it’s official he has the right stuff and joins the ranks of other high-profile directors (dare I write Kubrick, Spielberg, Scorsese) in that a Damien Chazelle-directed film can (and probably should) be considered a big deal. This isn’t to say “First Man” is perfect, but it renders a strong, lingering effect. Even if it wasn’t based on the real-life events leading up to Neil Armstrong being the first man to walk on the moon, it makes us realize just how ambitious, painstaking, exhausting and overwhelming any space mission can be. Sure, it’s easy to write off what NASA accomplished during the 1960s “space race” with the Soviet Union as just “rocket science,” which cost millions in taxpayer money and is an area of study only the most brilliant minds are capable of understanding, but “First Man” shows there were humans behind the science, and despite their intellect, accomplishing their goals was anything but easy—neither technically nor emotionally. It’s obvious this is just one of the insights Chazelle and his team wanted us to take away from the film, the other being a more visceral experience of what it’s actually like to be an astronaut, especially with regard to the physical requirements. I’m sure there were several consultants who worked on the film to ensure conditions were as accurate as possible, but, at the end of the day, it’s not about how factual the film is (it is, after all, a Hollywood movie) but how well, given its context and what it sets out to do, it puts us in the shoes of the characters, and that “First Man” does extremely well. Consider the opening scene, which finds Armstrong (Ryan Gosling), already a seasoned pilot and employee of NASA, confined in the cockpit of an X-15 rocket plane. The camera is in a tight close-up, as it will be for most of the interior rocket scenes, and Armstrong, whom we’ll learn was so persistent in pushing space missions as far as they could go, calls his own shots and holds the aircraft nose up longer than intended as a way to test its limiting performance. Watching this scene, we feel as trapped, sweaty and anxious as Armstrong, determined yet wondering if we’ll be able to move or breathe freely again. As the film chronicles the seven or so years of various tests and missions that eventually led to the famous Apollo 11 moon landing on July 20, 1969, it will present many scenes like this, driving the point home that being an astronaut was tremendously taxing on the mind and body. But Josh Singer’s screenplay, based on James R. Hansen’s book, isn’t wall-to-wall science and space mission scenes. It devotes just as much time to Armstrong’s “ground” life and the effects an astronautical career has on one’s emotional well-being and familial relationships. Early on, it paints Armstrong as a vulnerable man and quickly demystifies his typical “American hero” image that most viewers, including myself, automatically attach to him. We see Neil as a devoted husband and father, playing with his two-year-old daughter, Karen, who was diagnosed with a malignant tumor when she was only 1. She passes away shortly after and I admired the screenplay for keeping this tragedy separate from the science aspect of the film because it establishes Armstrong as a fully-rounded man, one who was not too pre-occupied with his career to express love and devote time to his wife Janet (Claire Foy) and their two other children. Eventually, Armstrong would put his career first, especially as the possibility of a moon landing starts to become a reality and the pressures and expectations from NASA (and the country) start to wear on him, but these early scenes allow us to see he was more than just an “American hero”; Armstrong could laugh, cry, dance, play, be social, and act withdrawn. “First Man” is every bit a character study as it is a historical drama. As it progresses, the film’s structure becomes more evident, which is more or less equal screen time between the space missions and the drama involving Neil’s family. And while this back and forth pattern holds our attention throughout the near two-and-a-half-hour runtime, I couldn’t help but think the filmmakers seemed unwilling to waver too far from it. As the NASA missions become more dangerous and complex, and as the people involved endure more tragedies, the film seems a bit too complacent to stick with the presentation it knows. Don’t get me wrong; we respond to both the action and drama throughout, and the elongated, final sequence is a well-earned, beautiful, and emotional culmination of all the events leading up to it. But on the same token, the filmmakers play things a little too safe. 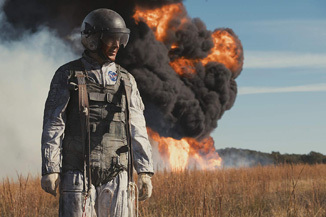 Perhaps Chazelle’s “Whiplash,” which tossed and turned viewers to show the intense, cut-throat, and high-pressured lifestyle of being a student at a prestigious music school, set me up to think “First Man” would take greater cinematic risks and maybe even employ experimental filmmaking strategies to portray the space missions or the characters’ fragile psychological states. Instead, it applies a more traditional, classic shooting scheme, embracing static shots and long takes, with Chazelle shooting partially on 16mm film to recreate the NASA footage. These methods are effective but not overly adventurous. That being said, on an emotional and production-values level, “First Man” is quite superb. Ryan Gosling once again reminds us of his range and ability to embody a character who can be both a strong, stubborn, no-nonsense career man and a soft-spoken, loving, vulnerable kid at heart (I’ve no doubt the real Neil Armstrong had the same kind of dimension), and he’s entirely convincing. The same must be said of Foy, who, after “Unsane” and now this film, continues to shed the idea that she can only play Queen Elizabeth II on Netflix’s “The Crown.” Gosling and Foy are very well-matched as husband and wife and we believe they really are two married people who want both normalcy and spontaneity in their lives. Chazelle and his frequent cinematographer, Linus Sandgren, film a lot of the one-on-one character scenes in close-ups, which puts a lot of pressure on the actors to deliver true, heartfelt emotion, and they’re completely up to the task. And this doesn’t just go for the leads, but also the first-rate supporting cast who play the various NASA staff and their families, including Jason Clarke, Shea Whigham, Corey Stoll, Patrick Fugit, Lukas Haas, Olivia Hamilton and Kyle Chandler. On a visceral level, “First Man” is just as captivating, and this isn’t limited to the final sequence. Each time the filmmakers recreate a NASA space mission, Sandgren’s cinematography, Ai-Ling Lee’s sound design, and Justin Hurwitz’s music work in harmony to completely envelope us. Oftentimes, such filmic elements escape our notice, which is no fault of those creating them, but certain stories call for them to be more distinct, and “First Man” tells one of those. Chazelle and his team know this and extend their resources as far as they can go, never willing to compromise or rush the narrative. As I think back on “First Man,” my appreciation for its drama and production just keeps growing. I do wish the filmmakers had been more willing to bend the classic epic structure, but I can forgive them for making safe choices because of just how far they take what they have. True, as a “safe film,” “First Man” does seem poised by the studio to win awards, and whenever this is too obvious, it can hinder the movie-going experience, but “First Man” is so stirring and tenacious with the way it engages our hearts, our minds and our bodies that we walk away from it feeling like we’ve had the same arduous experience as the people in it. This is an effect Chazelle and his team continue to achieve with each film they make.